The 28.14 metre motor yacht Neval, listed for sale by Oliver and Torsten Sieckmann at Sieckmann Yachts, has been sold in a direct deal to a German client. 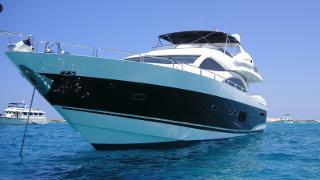 Built in GRP by UK yard Sunseeker International to RINA class, Neval was delivered in 2005 as a Sunseeker 94 model. Decorated throughout with high gloss cherry wood paneling and textured cream carpeting, she sleeps eight guests in four cabins consisting of a master suite, VIP suite and port and starboard twins, all with entertainment centres, television screens and en suite bathroom facilities. In addition, all cabins have opening portholes to allow in welcome fresh air. The main deck saloon has comfortable sofa seating to port and starboard, a coffee table and an entertainment centre including a 32 inch plasma television screen and a Bose surround sound stereo system. Forward is a dining area with seating for eight guests, a sideboard for storage of glassware, china and cutlery, and there is also a full wet bar here with two stools. The aft deck lends itself to outdoor dining with an upholstered bench seat, a teak table and five director’s chairs, and leads down to a hydraulic swim platform giving easy access to water toys. Up on the flybridge amenities include a helm station, two teak dining tables, seating for eight guests, a sunbathing area, a bar, fridge and a Gaggenau grill. Twin 1,800 MTU diesel engines give her a cruising speed of 23 knots. With only one owner since new, Neval was asking €1,690,000.